Heavy-duty, industrial quality, dual purpose jack. 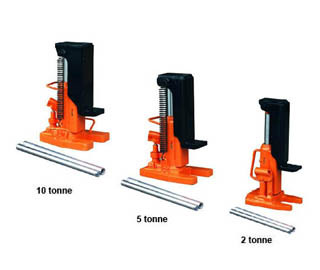 Designed for lifting loads with very low minimum clearances (foot) or high clearances (head). Great companion tool for machinery type rollers. Convenient 2001/2 swivel socket for easy operation in any direction on 5 and 10 ton models. Safety valve for overload protection. Features spring assisted return and over-travel protection on 5 or 10 ton models. Ram is made of heat treated special steel to resist rust and assure strength. Conforms to ANSI/ASME B30.1 standards.